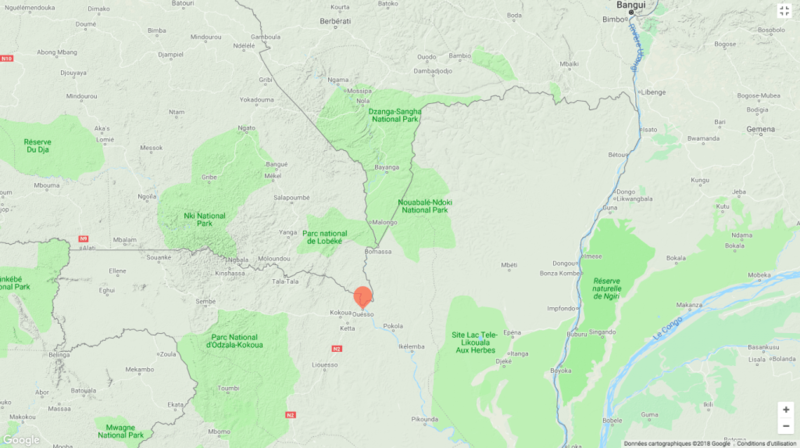 After months of tracking one of the most notorious ivory poachers in the northern Republic of Congo, authorities finally caught the man — let’s call him “John” — in July 2016, at a road checkpoint on the edge of Nouabalé-Ndoki National Park. Following several thwarted attempts to bribe the court judge and other officials, John was sentenced to five years in prison — the maximum penalty for wildlife crimes in the country. Ouesso, Republic of Congo is the largest town near several protected areas, including some across the border in Cameroon and the Central African Republic. This proximity makes the town an important transfer point for ivory and other illegal wildlife products — and a smart place to focus anti-trafficking efforts. John was transferred to a jail hundreds of miles away in an effort to isolate him from his network. However, he soon escaped and was on the run again. Eventually recaptured and put back in jail, John remarkably nearly eluded justice again; prison officials lost his paperwork and were preparing to release him if it could not be recovered. Staff from the local office of the Wildlife Conservation Society (WCS), one of the organizations closely involved in John’s arrest, promptly brought copies of the relevant papers to the jail, keeping the alleged poacher behind bars — for now. Stories like this are all too common in the courtrooms and jails of Central Africa. Even as poachers and traffickers are wiping out wildlife populations and robbing local people of natural resources, pervasive corruption, inadequate funding and poor communication have turned the process of catching and sentencing criminals into a virtual game of Whack-a-Mole. Focus too much attention in one place or on one part of the system — for example, on ramping up ecoguard patrols within protected areas — and poachers will pop up in a new location, or use bribes to avoid sentencing, or escape from an overcrowded jail. Dismantling the poaching and trafficking networks that are exterminating some of the Earth’s most iconic and valuable species requires fighting this war on all fronts. Perhaps the least publicized of these has been the judicial system itself. 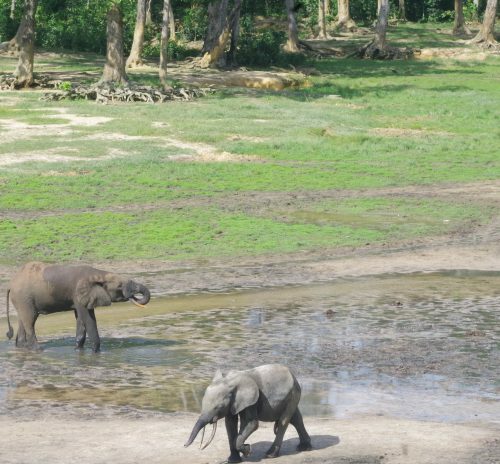 By helping local courts hold wildlife criminals accountable, WCS and other partners in USAID’s Central Africa Regional Program for the Environment (CARPE) initiative are starting to slow the pace of poaching — and ensure that species like the forest elephant will be around for generations to come. The hunting of wild animals is hardly new in the Congo Basin, a vast swath of rainforest — the world’s second-largest — that extends across Central Africa. Local people have always depended on the forest for meat, and the Central African ivory trade has deep roots in the colonial period. However, the sheer scale and escalation of wildlife loss across Africa in recent decades is alarming and unsustainable, particularly for elephants. 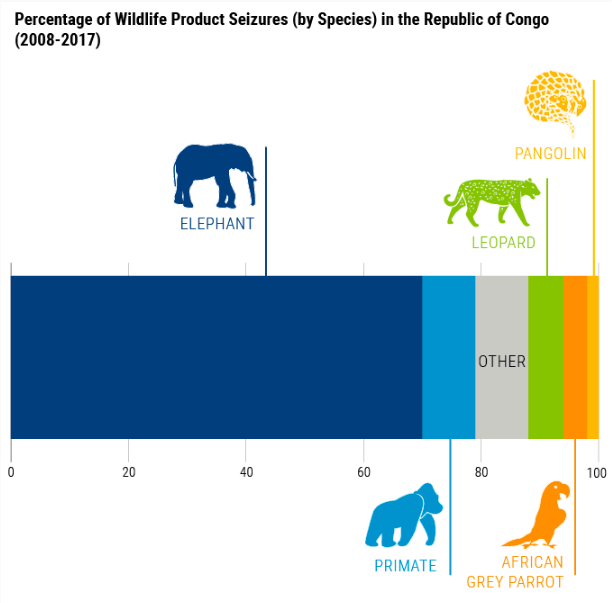 According to WCS research, ivory currently makes up about 70 percent of wildlife product seizures in the Republic of Congo. Forest elephants, a distinct subspecies found only in Central Africa, have been harder-hit than their savannah cousins. A 2015 study that used DNA data to trace the origin of African elephant tusks seized in Asian ports identified Central Africa as one of the two major elephant poaching hotspots on the continent. Forest elephants congregate in huge numbers in mineral-rich clearings called “bais,” making them easy targets for poachers; their pink-tinted ivory is especially prized. 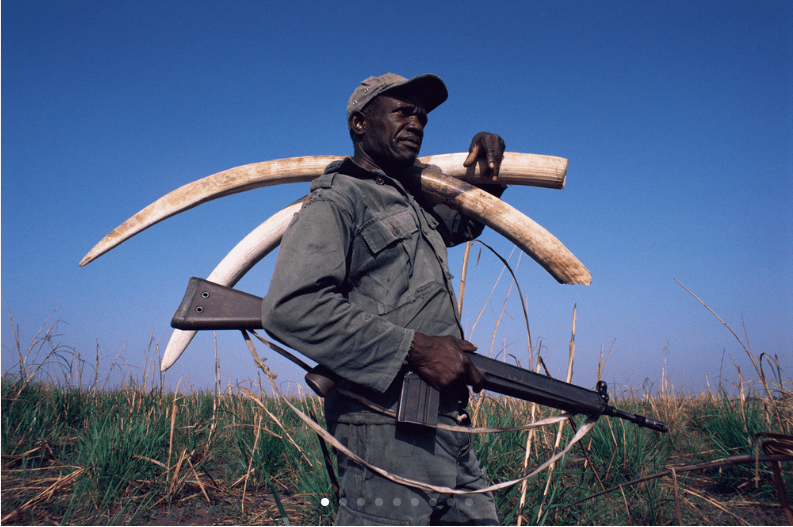 The illegal killing of elephants for ivory has become highly organized, with groups of poachers armed with AK-47s and fueled by the promise of mounds of cash unavailable to most through legal means. 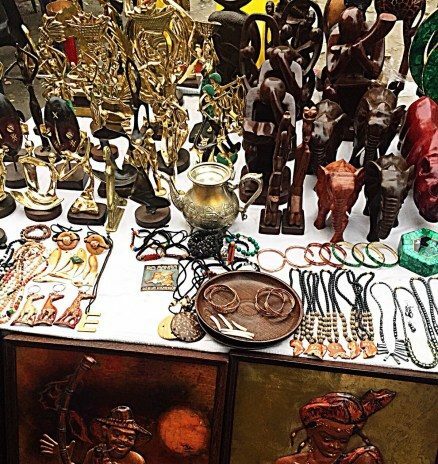 In the northern Republic of Congo, gangs of poachers are more frequently venturing from neighboring countries — the Democratic Republic of Congo, the Central African Republic — to exploit a quickly vanishing resource used mainly for decorative purposes in countries like China and Vietnam. Across Africa, many of these trafficking networks have links to terrorist groups such as the Lord’s Resistance Armywhose nefarious activities are at least in part funded by ivory profits. A recent WCS-led study estimated that between 2002 and 2013, forest elephant populations declined by 65 percent, principally to fuel the ivory trade. This isn’t just devastating for elephants; it’s bad news for people, too. As the global scale of the trafficking networks reveals, almost none of the ivory trade’s profits actually benefit the communities or countries where elephants live. 2018 marks the 25th anniversary of Nouabalé-Ndoki National Park, where thanks to long-term financial support from the U.S. government through USAID and the U.S Fish and Wildlife Service, WCS has been supporting the Congolese government since the park’s creation. 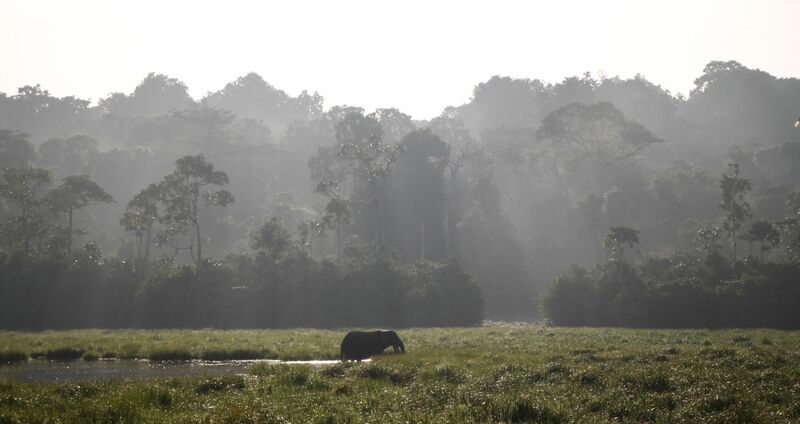 It contains an extraordinarily intact, dense, humid forest which harbors important populations of forest elephants, bongos (a kind of forest antelope), chimpanzees and western lowland gorillas. Anticipating, detecting and stopping illegal activities in this forest presents unique challenges; hidden in the dense undergrowth, poachers can hide more easily than in other environments. Therefore, the anti-poaching force must collect as much information as possible on the patterns of poachers and traffickers, as well as key access points used to get into the park. This information can come from a variety of sources. When ecoguard patrols come across human footprints and other poaching signs in the forest, they record and analyze their observations using the Spatial Monitoring and Reporting Tool (SMART), an open-source database used to enforce wildlife laws around the world. Residents of villages on the park’s periphery can also send preemptive alerts to park authorities when poaching gangs have arrived nearby with plans to enter the forest. Taken together, the data gleaned from these timely, detailed observations are beginning to turn the tide in the park’s favor; by anticipating their movements, park staff are starting to move one crucial step ahead of the poachers. “If there aren’t ecoguards, the elephants in the forest will be finished,” said Lince-Rolf Mabikana, an ecoguard in Nouabalé-Ndoki. 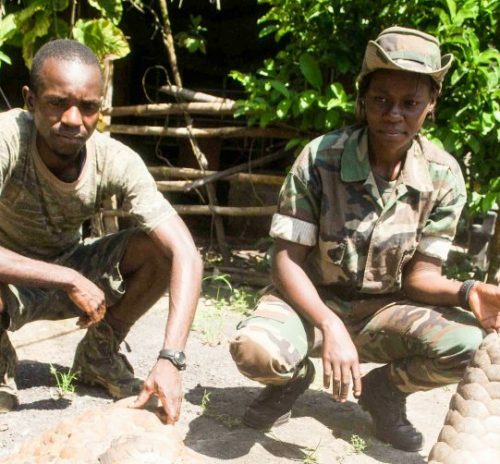 But although the park quadrupled the number of rangers monitoring its forest between 2014 and 2016, wildlife products such as ivory, bushmeat and pangolin scales were still pouring through Ouesso, a town that acts as a gateway to Nouabalé-Ndoki and other parks in the Central African Republic and Cameroon. Clearly, anti-poaching patrols in the park and surrounding forest concessions weren’t enough. So in February 2016, WCS decided to look in a new direction: toward the courts. To promote stability in remote, harsh environments like rural Republic of Congo, strengthening the judicial system and overall rule of law is crucial. While making the arrest is important, it is only the first step in an arduous process that currently provides many escape hatches for those with enough money and connections. One local official told WCS that about 80 percent of court cases in Ouesso are related to wildlife poaching or trafficking, yet few (if any) lawyers or judges specialize in the subject. That’s where Leslie Oboua comes in. A paralegal on the WCS team, her job — to support the enforcement of the law — begins as soon as someone has been arrested. Some days this means gathering paperwork for an upcoming court hearing to ensure that the judges have all the documents they need: names, dates, number of infractions, locations, type of wildlife products seized and more. WCS is currently producing a database of this information in order to increase transparency and ensure that repeat offenders receive harsher fines and prison sentences. One or two days a week, a member of Oboua’s team visits convicted poachers or traffickers in jail to confirm that they are still there. If a prisoner claims to have a medical condition (a common ruse to request release), she will bring in an independent doctor to assess him. If the ailment is real, WCS will even pay for his medication — provided he remains incarcerated. Sometimes Oboua will learn through the grapevine that a prisoner is planning on bribing the judge, in which case she lets the judge know that she’s paying attention.“We and other civil society partners we work with provide an independent presence, acting as watchdogs to stop this from happening,” Stokes said. Garnering media attention is another strategy that can help reinforce poaching laws. Publicizing arrests and trials of prominent wildlife criminals with newspaper articles and radio stories makes it harder for them to sneak out of jail unnoticed. All this work is beginning to pay off. 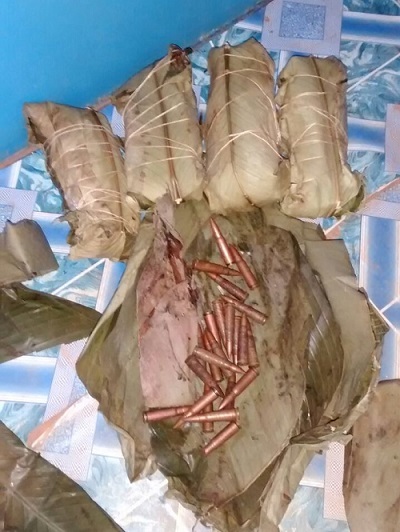 In 2014 and 2015, 80 people were arrested in Nouabalé-Ndoki. Not one of those cases made it to trial. In comparison, between January 2016 and April 2018, 96 poachers and traffickers went to trial in Ouesso, the court handling most of the park’s cases. So far, this has resulted in 45 major convictions (some of the cases remain open), 18 of which saw the maximum jail sentence applied. Support from WCS and other NGOs has also helped shrink the time between arrest and verdict. For example, on February 2, 2018, three ivory poachers were apprehended with almost 70 kilograms of ivory and an AK-47 while exiting the forest. Before the month’s end, they were sentenced to the maximum penalties possible: five years in prison and fines equal to US$ 10,000. This four-pronged approach to fighting wildlife crime — which includes intelligence-based investigations; law enforcement; supporting the judicial process; and media outreach — is not a new concept. WCS and the other CARPE partners were inspired by success that the EAGLE Network (along with local affiliate PALF) has had elsewhere in Africa. Outside the continent, recent commitments by ivory demand markets such as China, Taiwan, the U.S. and the U.K. are a promising sign. But while momentum to save elephants and other species is growing, this milestone will be impossible without continued investment. Urgent as it is, the poaching crisis cannot be fixed overnight. In a region cursed with inadequate infrastructure, equipment and funding for conservation work, continued support from the global community — including the U.S. government — is essential to replicate what works and coordinate efforts to fight wildlife crime across borders and sectors. Only through swift and steady collaboration can we fight the extinction of valuable species and help maintain the forests that make life possible for humans and wildlife alike.